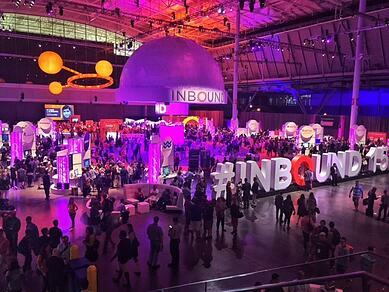 INBOUND: A conference of epic proportions hosted every year in HubSpot’s backyard for customers, industry leaders, and marketing and sales professionals alike. INBOUND is equal parts TED Talk, rock concert, and business boot camp rolled in to 4 days of motivational awesomeness. As an INBOUND newbie this year, I was excited for the opportunity to learn from and be inspired by a dynamic line up of keynote speakers, ranging from best selling author and marketing prophet Seth Godin, to author & comedian Aziz Ansari, to social activist and political royal Chelsea Clinton. Attendees also had the opportunity to gain insight from their peers during a jam-packed 3-day agenda of strategic talks, breakout sessions, workshops, and product deep-dives. While at the conference, I was asked to represent our agency and document our personal INBOUND experience on Twitter. 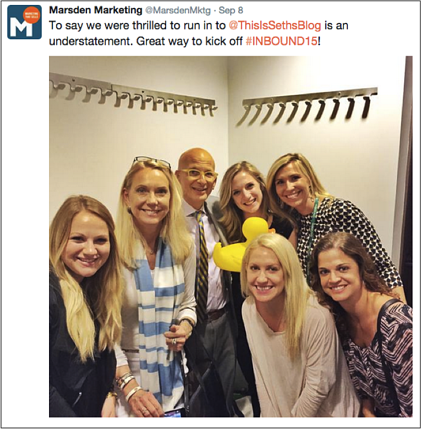 As this was my first major industry event, I thought I’d share some social media best practices and key takeaways for live-tweeting at an event I learned along the way. Is there a hashtag for this event? Be sure to include it in ALL tweets to stay connected to the event network. Does the event or company/organization hosting the event have a Twitter handle? Be sure to tag them when appropriate. Is there a mobile app for the event? Download it! Many event apps have great tools for managing your event schedule and networking while you’re there. Spread the word to your fans and followers in the days leading up to it that you will be live-tweeting from the event that week. Be sure to post on your LinkedIn company page, (and any other social accounts as well), to reach different audiences. Be aware of any policies regarding media (photographs, NDAs, videos, etc.) for the event before you start posting. You don’t want to get flagged for posting photos of new product announcements or selfies with the CEO if they kindly asked you to refrain ahead of time. Looking to network? See if the event is promoting any opportunities to meet up with your fellow attendees. Already planning on attending a networking event? Let people know. Tweet out a few times ahead of the event with the time and location. Does the event’s website list any media contacts or partners that will be at the event? Make a list of goals ahead of time. Who do you want to talk to? What stories or ideas would you like to pitch to them? As any good PR person will tell you, be sure to include links to your website, social media accounts, and your blog when handing out your information. Events are a great way to interact with key industry leaders and speakers. Do a quick search on Twitter and see if the upcoming speaker, or their organization, has a Twitter handle you can include in any tweets you send about their session. Try not to start tweets with a person's handle, even if you're replying to them; it will only show up in the timelines of people who follow both you and the person you respond to. If you want your response to be visible to everyone who follows you, put a period or text before the @username. It can be distracting to tweet during the event, and can also take away from your personal experience of the session. Write or type “retweetable” content down as it's being given, and send tweets out after the speaker has finished. This is also good to do if you plan on writing a follow up blog post about the event. Images and videos are a great way to mix up the content you’re sharing at events. Messages with media also tend to get shared and retweeted more often than text tweets. Take a picture of the speaker or an important slide from the presentation, (if possible), and include it in your tweets for added engagement. Sharing your own experience from the event is great, but this is also a good opportunity to interact with your peers. Follow the event hashtag to see what other attendees are talking about. Reply to, retweet, or favorite other great posts from your favorite sessions, or ones you weren’t able to attend. 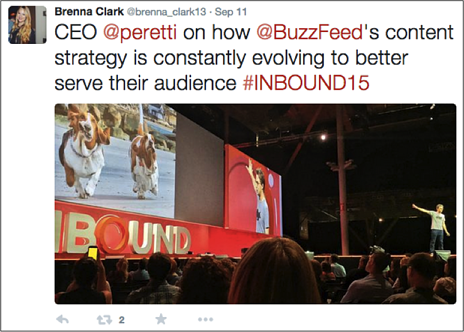 Even if you’re tweeting from a company account, events are a great way to show the personal side of your brand. Share pictures you snagged with event speakers, other attendees, or your group at a networking event. Nothing is worse than sending out a social media post with an epic grammar or spelling mistake. Proofread your posts, read them out loud, or have your co-worker read it before you send it out to the masses. Feeling more prepared for next time your boss asks you to take the social reigns for your company? We hope so, (and if not, to take on the road with you). 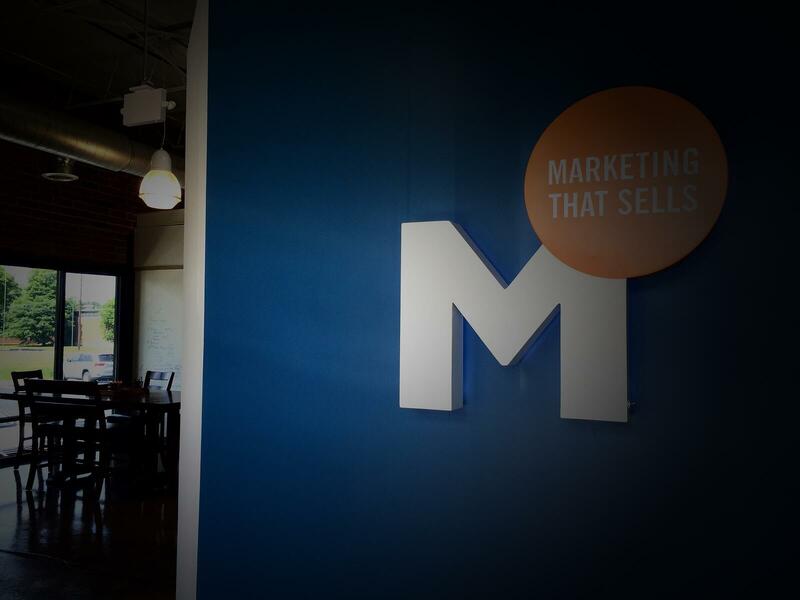 And finally, as promised in the title, here a few of the best lessons I took away from my time at INBOUND.